Hey beautiful people, how've you all been? It feels like ages since we actually talked. How's everyone doing? Can you believe, it's March already? Todays outfit is as minimal as ever, flares are the new in thing as trends of the 90s are back in vogue. 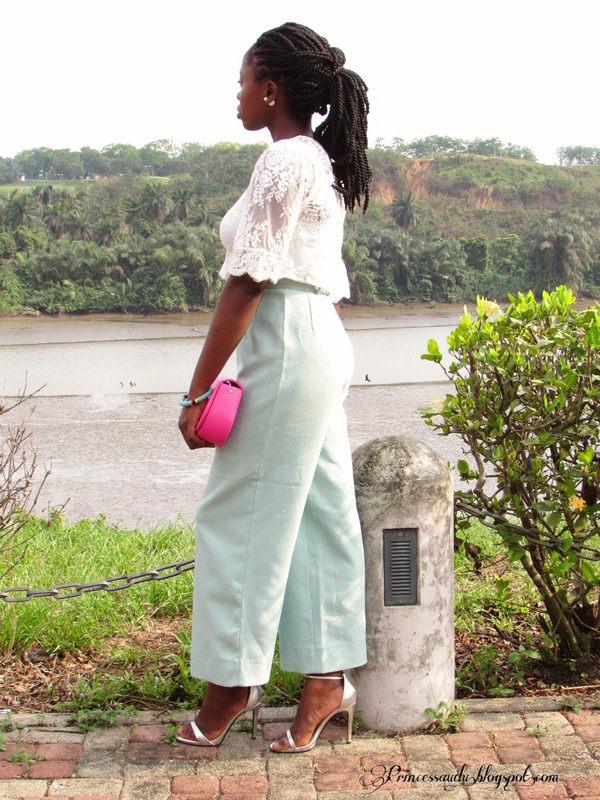 Hence I styled my flared mint high waist trousers (styled here and here), with a delicate lace blouse. 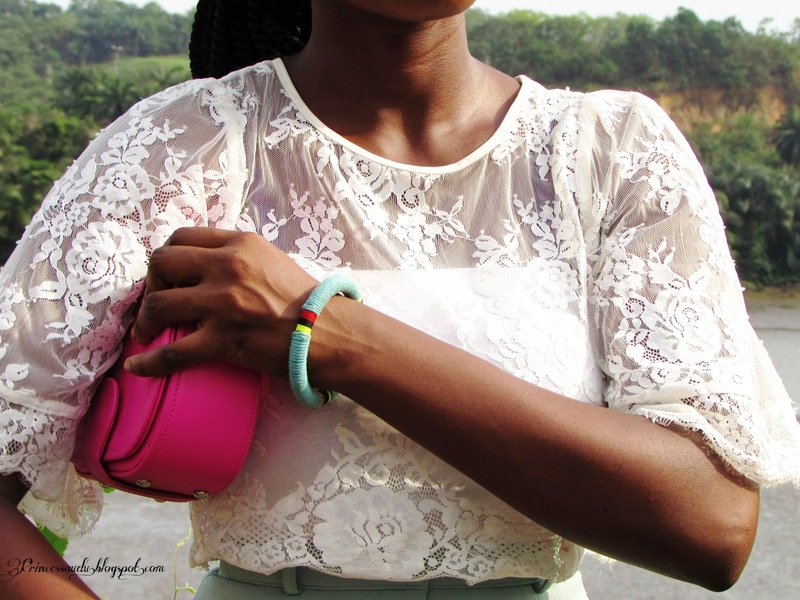 Finally, I added a pop of pink and a simple bangle. Onto hair, I've gotten a lot of suggestions to try weaves. Now while they are really not my thing it's actually something I'm looking into, for the sake of my reseeding hairline especially. 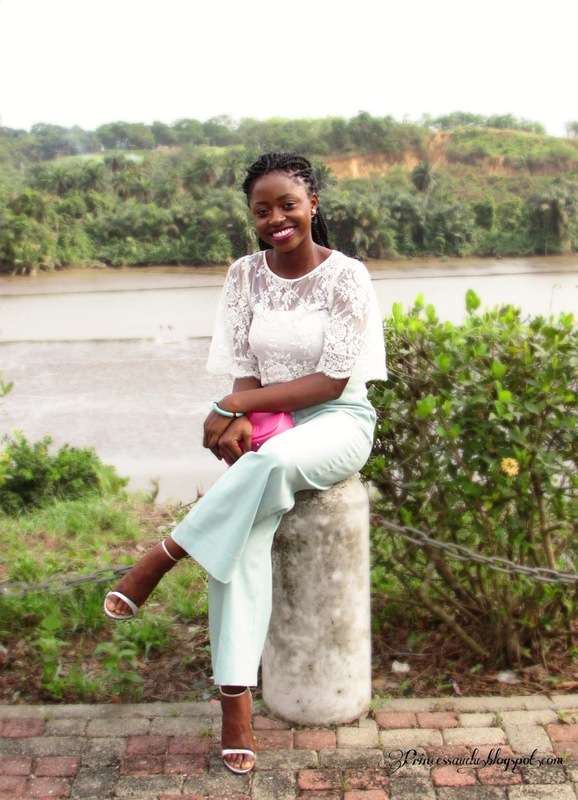 But the truth is your girl is on a budget hence my post on a broke chic's guide to staying fashionable. It'll be braids for now or yarn locks, which I'm sporting in this look. Shoutout to my newest photographer and all of you, who in one way or the other have contributed to the growth of this blog. I know,I don't say this often enough, but thank you all so much. I feel for my hairline too. I am struggling to grow it back...I love this outfit! Your style is amazing! 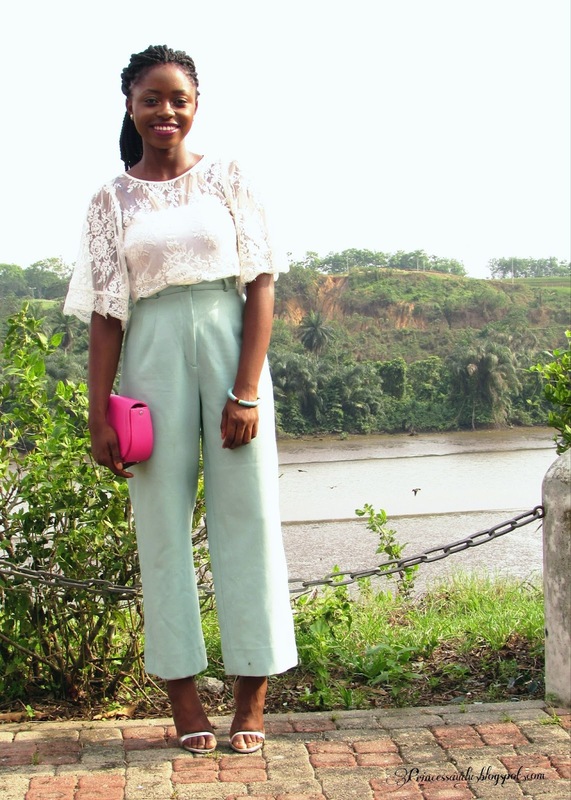 These pants are very stylish and look gorgeous with this top! Lovely look! those pants are the creme, the color and its design, wow! 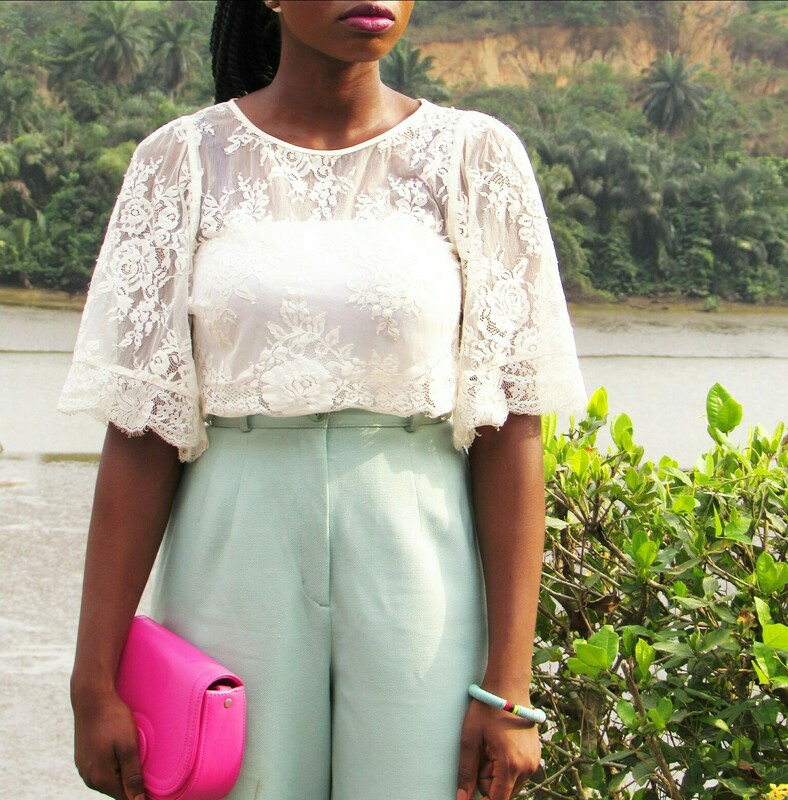 Love everything about this look especially the lace top!!!! Cute. And I like the surroundings. Erm... weaves for your hair line is a big no-no! 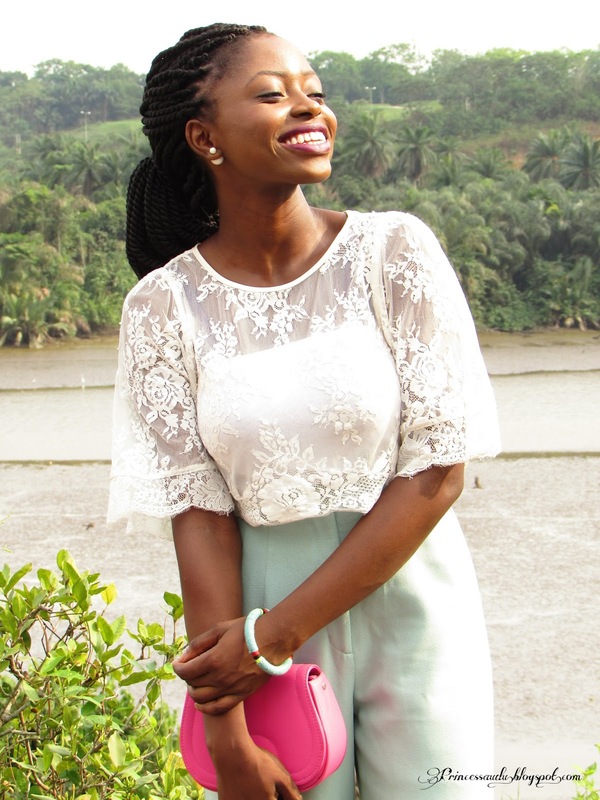 Try crochet braids or leave your hair out. Hey girl ! I love this look ! Still looking forward to the weaves. So true about Berry's comment. YEAH, THIS YEAR HAS LONG WIGS.. I AM HAPPY BECAUSE I CAN NOT WAIT TO BE OUT OF MED SCH..LOL. NICE TOP DEAR. HOW ARE YOU? Love the pants and the pop of pink with the purse. I like this look and the location a lot. Loving the top esp the sleeves. 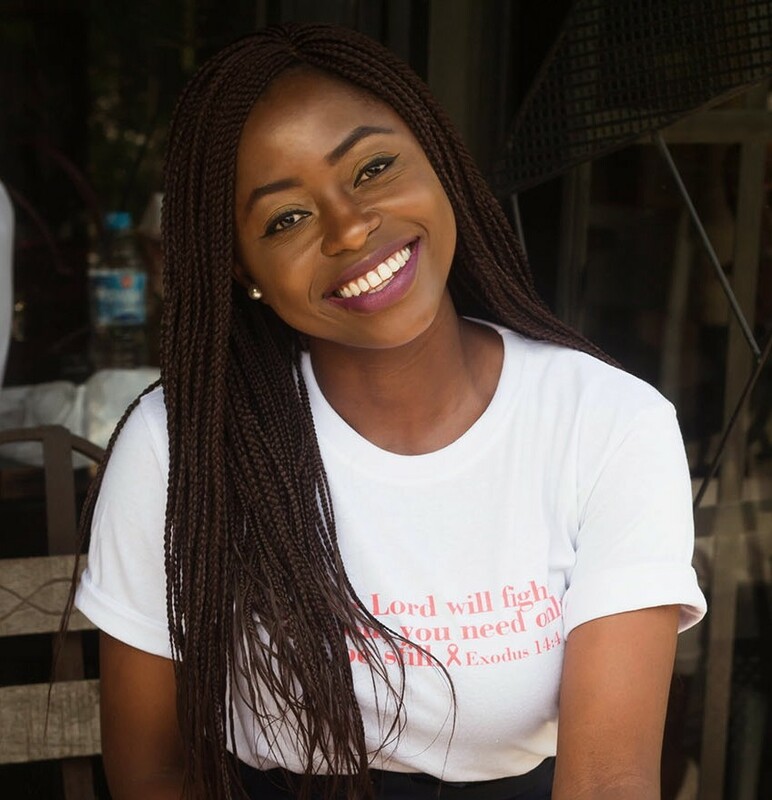 Braids, weaves, crochet braids, whatever, they are all bad for your hairline if done too tightly. I just stopped braiding or doing anything to my edges. I just leave it like that. Castor oil works wonders for edges too. 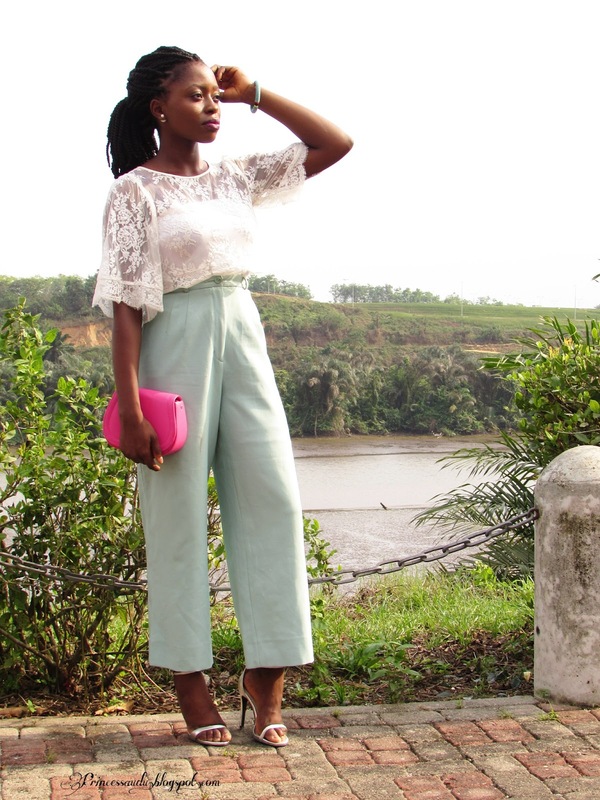 Loving the color of those pants and with the lace you look so chic! Glad I came across your blog!